Provide comfort for the family of Dymphna Darby with a meaningful gesture of sympathy. 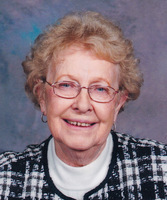 It is with profound sadness that we announce the passing of Dymphna Mary Patricia Darby of Edmonton, AB, on January 25, 2019 at the age of 79 years. Dymphna is survived by her sons, Thomas (Mary-Lou) and Kevin Darby; grandchildren, Tucker and Lauren Darby; stepchildren, Sean Darby in Toronto, Leigh (Betty) Darby and their children, and Lynne Darby in Vancouver. Dymphna was the tenth child in a family of eleven. She leaves her brother, John (Joan) McNally; sisters, Anna Holland, Agnes McCall of Red Deer and Maureen (Mario) Scrivano; as well as nieces, nephews and relatives too numerous to list. Predeceased by her husband, David Eugene Darby in 1992; infant son, David Liam Darby in 1976; parents, Andrew and Anne McNally; brothers, Albert (Helen), Andrew, Joseph (Grace), William (Jackie) and George/Al (Caroline) McNally; and sister, Gloria (Stan) Husband. Dymphna was a teacher with the Edmonton Separate Schools and later a long time employee with Edmonton Public Library. She was a kind and gentle woman loved by all who knew her. Special thanks to Dr. T. Flanagan & Dr. E. Estey, all her caretakers and CapitalCare Norwood for all their care and kindness. Special thanks to Jane Oryduzk & Maria Miguens, Dymphna's lifelong friends. Funeral Mass Saturday, February 16, 2019 at 1:00 p.m. at St. Alphonsus Roman Catholic Church, 11825 – 85 Street, Edmonton. Cremation has taken place. A private family inurnment will be held a later date at Holy Cross Cemetery. We encourage you to share your most beloved memories of Dymphna here, so that the family and other loved ones can always see it. You can upload cherished photographs, or share your favorite stories, and can even comment on those shared by others.